Flash breaks ranks during Batman's raid on a Clayface robbery and pays the price crashing into department store toys. Clayface and his gang of thugs disguised as Santa and his elves beat down on Batman and his squad of heroes. As he confronts his nemesis, The Batman, he is suddenly flash frozen from the inside out. The Atom re-enlarges and reveals he and Batman had a contingency plan to insert a freezing device should their initial plan failed. The Flash is annoyed that Batman is forcing him to do Watchtower duty as penance. Batman growls that if Wally wasn't so keen to get his Playtendo 720 he wouldn't have allowed one of Clayface's minions to escape. Before Wally can rejoin the League he has to apprehend the runaway criminal, much to his dismay. He is still keen to go shopping so he tries to rush through his duties and questions Batman's anti-Christmas spirit. He whisks Wally back in time to a Kent family Christmas. There Clark, Ma and Pa invite Batman to enjoy a traditional family meal. As welcoming as they are Batman cannot help but feel uncomfortable, naturally Flash finds this hilarious as it backs up his theory that Bats is a moody grump. Suddenly they are in Wayne Manor a year after Bruce lost his parents. Bruce is suddenly a young boy and very distant. Alfred tries his best to use Christmas as a way to open up Bruce and distract him from his grief. At first it doesn't work, Bruce is as frosty as his adult self. Suddenly Bruce wakes up from his perpetual misery and finds an action figure of his favourite hero - The Gray Ghost. Flash is surprised to see Bruce enjoying himself. It is all going so well - until Bruce spies his parent's portrait. All the joy erases and despite Alfred begging the boy not to, Bruce abandons Christmas in favor of training. The Flash watches as Alfred cries for Master Bruce's lost childhood and begs Phantom to take him home to present day. Bruce feels shame to experience joy and Flash finally realizes it. Thanking the Phantom Stranger for opening his eyes he restarts his quest for the Clayface's rogue hoodlum. He makes short work of the criminal when he spies a department store robbery. Suddenly as he is about to leave he spies something even more special than his Playtendo 720. As he teleports to the Watchtower Wally approaches Bruce. Bruce of course is suspicious and shocked that Wally hunted down something close to his heart - a Gray Ghost action figure. Wally smiles and tells him that Superman was gossiping that he and Bruce loved the show as kids. Wally is just about to retire to his quarters when Bruce issues his own surprise. Despite it being sold out everywhere he was able to get Flash's favourite console. So everyone can share a happy holiday after all. Story - 5: I wasn't expecting much, I'll admit that. What we got was a fantastic issue this Christmas. Insights into Clark, Bruce and Flash and an appearance from the Phantom Stranger. If you read one holiday comic this year let it be this! Art - 4: OK at first I was ready to slam the artwork. It was as far away from JLU as the new 'The Batman' series is to being cool. HOWEVER it gels perfectly with the story. It grows on you very quickly while only vaguely following JLU character models. I can't explain it but it just works! 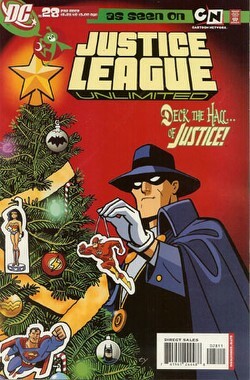 Cover Art - 4: The Phantom Stranger + Christmas + Ty Templeton = WINNER!